Pieter Vos is a top cop felled by dope and the disappearance of his daughter Anneliese three years ago, a disappearance that all his sleuthing skills was unable to crack. As a result he lost his partner to the politician Wim Prins and all interest in life. However, Vos is recalled to life and Marnixstraat police bureau Amsterdam by the eerily similar disappearance of Prins’ daughter Katja – even though Prins refuses to believe that she has been kidnapped because the girl is a drug addict. Vos is dragged into police work again by the klutzy Bakker, a country bumpkin with red hair known as ‘the aspirant’ and made fun of by the big city cops. Bakker and he make a quirky team with a terrier called Sam thrown in for good measure, though Sam is not an ideal police dog and has no pretentions to it. Set against the atmospheric Amsterdam, The Dolls House is replete with bicycle trails, sandwiches , canals and the interesting architecture that makes the city unique. Hewson does not overplay his hand with touristy snippets of clogs and even the tarts on Reeperbahn are given just enough time to be relevant rather than spectacular. Hewson adds several layers to his story to ensure that the reader is kept at work unraveling the different aspects of Dutch political life and crime, which includes the problem of migrants from Surinam forced into various rackets to make money. Local crime confronts migrant crime and the gangland twists and turns plumb depths that are sometimes a little too labyrinthine, while the body count increases. Vice writes Hewson, is a kind of business and those who dabble in it are committed souls. The author slips new characters deftly in his novel and can turn up the pace or slow it down with a practiced hand as he fleshes out his characters and gives depth to their ambitions and their past lives. He also throws in some exciting car chases to give a novel about police prodedure a thrilling dimension. Certain things can be gauged by a careful reader. It is obvious from the beginning that a police officer has to be involved in the morass of corruption – simply because that is the way that these city systems work – and one can even make an informed guess at the identity of the cop. It is equally obvious that Prins’ planned cleanup programme, Nachtwach, which takes its name from Rembrandt’s great painting in the Rijksmuseum, is doomed to failure because too many people have a stake in the city’s underworld. No one can be trusted. If there is a flaw, it is possibly the disappearance of the two girls that seems to strike rather a false note – the scene is set for a serial killer scenario which proves to be something else altogether. 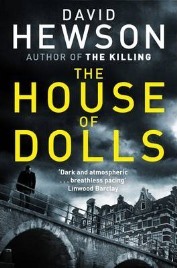 The House of Dolls has however been earmarked for a Dutch TV series, testifying to its success in portraying urban life and crimes in Amsterdam – though the way it is written in almost serial form, may have something to contribute to that. No Comments on "The House of Dolls"